Ami Chitalia, MD, is board certified in Internal Medicine as well as Hospice and Palliative medicine. Additionally, she is board certified in Medical Oncology and Hematology and a member of the American Society of Hematology and the American Society of Clinical Oncology. As a hematologist and medical oncologist, Dr. Chitalia focuses on the treatment of breast cancer through the use of chemotherapy, endocrine therapy, and targeted novel therapies through clinical trials. She also specializes in symptom management and setting goals of care as they pertain to patients with an advanced or complicated diagnoses. Each day, more research points to stepping away from chemotherapy and using novel, targeted agents to fight breast cancer. These therapies are among Dr. Chitalia’s clinical interests, as is the incorporation of her palliative care training to her oncology practice. Her research interests include curriculum development for trainees focused on palliative care as it pertains to the field of oncology. Additionally, Dr. Chitalia is passionate about studying health disparities related to breast cancer treatment. Dr. Chitalia received her medical degree from Tufts University School of Medicine. She then joined MedStar Georgetown University Hospital for residency in Internal Medicine before completing a one-year fellowship in Hospice and Palliative medicine at Mount Sinai Hospital. Dr. Chitalia then returned to Medstar Georgetown University Hospital to complete a three-year fellowship in Medical Oncology and Hematology. 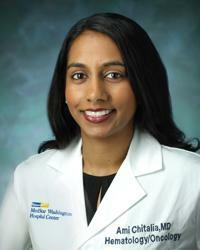 She is now a staff physician at the affiliated Medstar Washington Cancer Institute. “My goal in taking care of patients is to treat the patient as a whole, addressing not just their breast cancer but also trying to focus on symptom management, and the psychosocial and emotional aspects of their treatment. In order to be able to address all of the patient’s needs, I take the time to listen and make sure I know what the patient hopes to accomplish.